ADF&G offers a vast array of conservation education curricula and activities for educators. 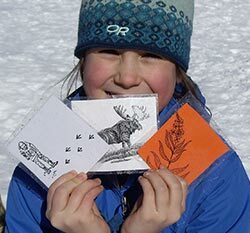 Topics range from lessons on skull identification and Alaska's fish and wildlife species to activities that engage students in outdoor field investigations or hands-on learning about wildlife management. ADF&G is the host agency for National Project WILD, one of the most widely-used conservation education curricula in the nation. We also offer the five-volume Alaska Wildlife Curriculum, which is based on Project WILD lessons uniquely adapted for Alaska's species and ecosystems. To ensure our educational materials continue to be relevant for teachers and students, many lessons are correlated to Alaska State Content Standards. The department maintains a searchable database for Project WILD, the Alaska Wildlife Curriculum, and Project Learning Tree that includes a search functions by state content standard or by topic. A Cure for the Cold, Let's Go Ice Fishing: This curriculum is designed to help the beginning angler understand the basic principles of ice fishing and the importance of responsible resource use in maintaining a healthy fishery. Alaska Wildlife Curriculum: This Alaska-specific curriculum for K-12 students consists of five volumes plus ecology cards. The Alaska Rainforest — Both the powerpoint slideshow and booklet are intended to provide an ecological overview of Southeast Alaska's temperate rainforest. Alaska Rainforest Slideshow (PowerPoint file 6,624 kB): The powerpoint includes background information in the notes section. There is very little text on the slides to provide educators flexibility to tailor the presentation to meet the interests of their students. Alaska Rainforest Booklet (PDF 1,063 kB): If you'd like a classroom set of this booklet, please contact Wildlife Education & Outreach Coordinator, Kristen Romanoff at: kristen.romanoff@alaska.gov or call 465-8547. Alaska Wood Bison Teacher Guide: This Alaska-specific teacher guide offers 1-12 grade activities for teaching about Alaska's wood bison. Bears of Alaska: This 64-page guide offers activities for teaching about all things bear-related. Whether it's hibernation, habitat or how to stay safe around bears, this guide is full of hands-on activities and information about Alaska's three bear species. Furs of Alaska Mammals: This 72-page teacher's guide offers activities for teaching about furs, plus resource materials. Project WILD, Aquatic Wild: This program of the Council for Environmental Education is for K-12 students. See our Early Childhood Resources for the companion curriculum, Growing up WILD, for children ages 3-7. Salmon in the Classroom: This Alaska-specific curriculum helps primary educators integrate salmon into the classroom. Seal Hunting and Safety: This student guide on seal hunting and safety and the accompanying workbook are designed for students in grades 4-6 for Alaska's Yup'ik communities. Skulls of Alaskan Mammals: This 70-page teacher's guide offers activities for teaching about skulls, plus resource materials. Watersheds: This presentation teaches about watersheds, the habitat needs of Alaskan fish at different life stages and throughout different seasons, and how people may affect watersheds and fish habitat.